So you want to make money online, uh? When you start blogging, you probably do it just for passion. But when you begin to invest your efforts in your blog, then you feel that receiving “something” back is the right thing. That “something” can be a monetary compensation for all your hard work. If you have some experience in blogging and internet marketing,then you know that using the right tools is the secret to accomplish your goals. In this post I am going to talk about one of the must have tools for your blog. MBP Ninja Affiliate plugin can make your blogging life much easier. This is one of the plugins you are not going to realize how useful it is until you install it in your site. The huge benefit is having all your affiliate links under one place, checking the stats and saving the time to go find the right affiliate product when you write a new post. or simply let the plugin add automatically links in your posts, depending on the keywords you have chosen. You may want to write all the keywords or variations that your link will apply to. For example, for web hosting product, you can select “host, hosting, website hosting”, and so on. When the plugin recognize any of these keywords in your content, it will automatically convert them to affiliate links. A great feature is that you can select the number of links you want the plugin will automatically add per post. I have chosen to replace at most 1 exactly same keyword per article and to not add more than 2 ninja links in my posts. Another fantastic characteristic of the Ninja plugin is that you can add variations of any of your affiliate links in order to track the different sources. You do not have to create an entirely separate link : you just add different variations of the same link. There are many other features in the Ninja Affiliate plugin. 6) Use NoFollow : you have the opportunity to select the “nofollow” tag for all your affiliate links (which is a good choice). 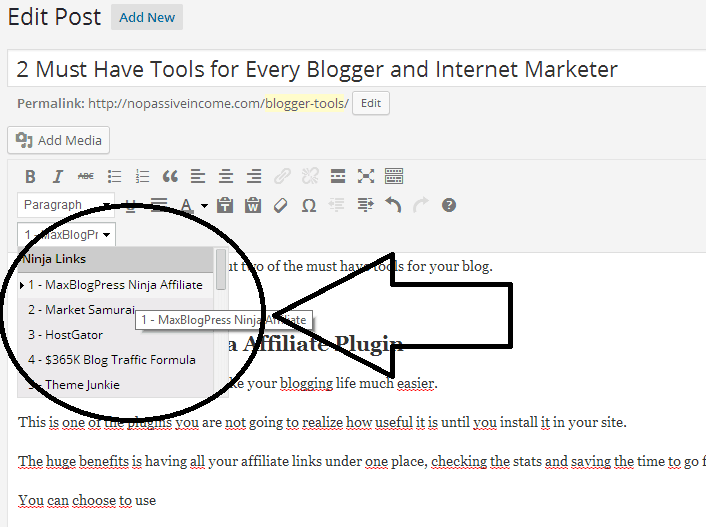 And remember, Max Blog Press Ninja Affiliate plugin use a smart caching, which won’t slow down your blog. If you are going to treat your blog seriously and you want to promote some products, then I suggest you to use MBP Ninja Affiliate plugin. It will improve your affiliate earnings and will help you transform into a professional or better internet marketer. Are you already using this plugin? I have add couple of affiliate links for different programs into my posts, but it was hard for me to track the performance or to edit and add affiliate link again, I only add an affiliate link once on the product but I forget to add links in future relative posts because it’s hard to keep a manual track of all affiliate links, This is would be an awesome alternative to automate the process, thanks for sharing about this plugin. you can see all the clicks made on each affiliate link looking in the main page of MBP plugin on your WP dashboard, which is pretty good for me. Also, adding or editing any affiliate link is not difficult at all. I guess it depends on each of us and point of views. You just provided such a great list of plugin. I’m now using Fight Theft and Use Nofollow, never heard the rest but i will try it definitely. thanks so much for your valuable information. If you need to promote affiliate products, then you should use MBP Ninja Affiliate plugin, Stephan. there is a table, where you can add, edit, or erase any of your affiliate links. Also, there is not a track system, but you can check how many clicks you had on that link. Which is enough for me. Thanks for sharing your thoughts, here, Ukash. Very helpful and useful. Thanks for sharing this great plugin review, it’s gonna be really useful. Glad you enjoyed the post, Pearl. This is a good plugin for amazon associates, yes? it’s a good plugin for any affiliate program, as you can add any links you like. Hey Erik. How would you compare this plugin with other similar ones like Pretty Links? I’ve never used “Pretty Links”, but I’ve searched for its features, and it seems similar to MBP Ninja Affiliate plugin. The “PrettyBar” is an interesting plus. Perfect timing – I was looking into this plugin a week ago and didn’t follow through with it, but you are definitely right – that is incredibly convenient! And it has an in-house tracking system. I am using Pretty Link but maybe I need to test this one out as well. after you tested it, please let me know your thoughts about it. And may be what you found more interesting in relation to “Pretty Links” plugin. Maxblogpress Ninja Affiliate plugin is an amazing and must to own plugin for affiliate marketers. I am also using it on one of my blog and getting good results. thanks for the kind words and for your comment. Hi thank you for sharing this review , it was very helpful and as a newbie these reviews help alot. I will be looking into MBP Ninja Affiliate plugin. Hi i have recently starting affiliate marketing this will be very helpful will give it a go and let you know how i get on. Seems quite awesome. Just would like to know if their is any more discount available to purchase it. It’s definitely worth the purchase, Harish! Thank you so much for the post. I was really looking for some automation tools to interlink my posts. But unfortunately I can’t afford premium tools sir. Anyway this tool sounds pretty good. Actually I didn’t figure out this post, hence sent you a message to reveal the secret behind this. Thank you so much for your quick reply sir. I want to know one thing sir. Is there any plugins available to interlink posts automatically?